The Last Circus features fearless filmmaking, which is not the same thing as saying that it features great filmmaking. Directed by Álex de la Iglesia, this action filled drama features a simple tale, garishly told. Set predominantly in 1973, it centers on the conflict between two circus clowns, one deemed the “Happy Clown” the other “Sad,” each of whom covets the same trapeze artist. While this might sound like a standard plot setup, de la Iglesia trumps it up with repulsive makeup effects, exaggerated violence, overt political subtext and frank carnality. The result is a heady mix of pop and art house filmmaking, obviously overambitious, but somewhat endearing as a result. Surely many who watch the depraved The Last Circus will find its delivery excessive, but it has a target audience of cinephiles who have been weaned on European horror films. While it would be inaccurate to call de la Iglesia’s latest an entry in the horror genre, there is no doubt that this is the work of a filmmaker who holds the genre dear. The way that he transforms the two clowns into freakish monsters over the course of his film or the verve with which he stages their assaults on one another make this unmistakably the work of a director who is a gorehound at heart. The Last Circus’ clear dependence on the horror genre makes some of its loftier pretensions difficult to support. It offers viewers an insane, untenable mix, which energizes this movie at the expense of coherence. While rare films such as del Toro’s Pan’s Labyrinth manage to wed overt political history and horror movie scares adeptly, the balance is difficult to achieve. 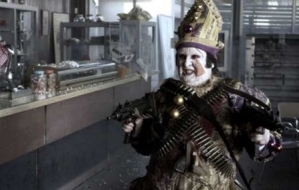 De la Iglesia has created a shallow allegory here, at best, with clowns that seem to have been conceived as fascist and the other a leftist, but the ultimate message of their conflict seems to be one of anarchy and destruction. While this might be an appropriate attitude to have toward the Spanish political landscape, when put into narrative terms it translates into a kind of meaningless that can grow exhausting over the course of the film. Sure to inspire a cult of fervent fans, but equally sure to repulse a great percentage of its viewers, The Last Circus is perhaps best appreciated for its off-kilter mix of politics and perversity.